Exxon Mobil, Chevron Shareholders Reject Resolutions Aimed At Battling Climate Change : The Two-Way But shareholders at Exxon Mobil approved one resolution that could make it easier to one day nominate an environmentalist to the board. 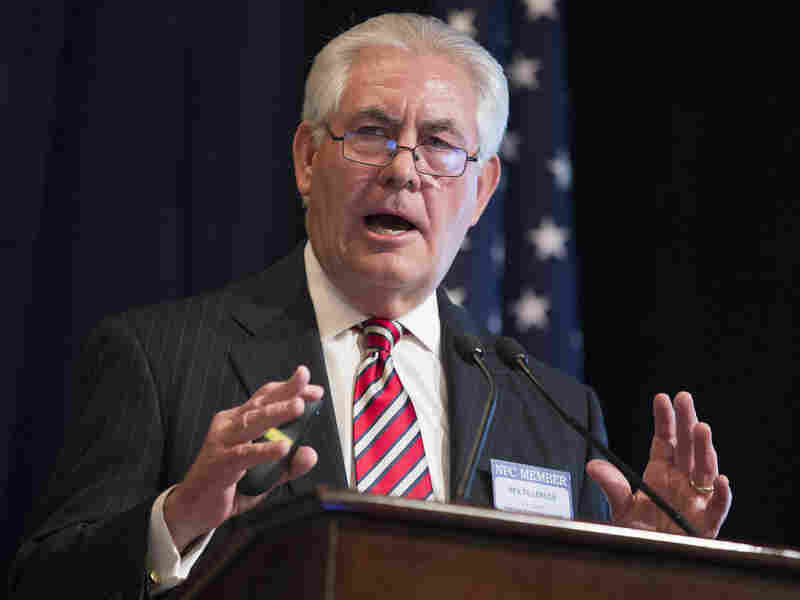 ExxonMobil Chairman Rex Tillerson, shown here in 2015, urged shareholders to reject the resolutions, arguing that not enough is known about the impact of climate change. The resolutions would have required the company to add a climate change expert to its board, publish an annual report on the subject, and pursue policies that limit global warming to 2 degrees Celsius. All were defeated at Exxon Mobil's annual meeting in Dallas. Chevron shareholders voted down a series of similar resolutions at their annual meeting in San Ramon, Calif.
One bright spot for environmentalists was the passage of the so-called proxy access rule by Exxon Mobil shareholders. The rule, which won 61.9 percent of the vote, could make it easier to bring outsiders such as a climate change scientist onto the board. "That's what we're basically asking for, is doing all that can be done with regard to cutting emissions," said Michael MacCracken, chief scientist for climate change programs at the Climate Institute in Washington, D.C.
"So it is a judgment of balance between future climatic events which could prove to be catastrophic but are unknown ... and the more immediate needs of humanity today," he said.